Htr Miamor Tequilla (#1) battles fellow qualifier La Vencedora( (#5) in Sunday's Grade 3 Oklahoma Derby trails at Remington Park. OKLAHOMA CITY, OK--MARCH 11, 2018--The final five races of 14 total on Sunday afternoon at Remington Park were trials for the Grade 3, $218,000 Oklahoma Derby. The trials were aided by a northerly tailwind that moved between 16-19mph. Royal Vista Ranches stallions' HEART OF THE CARTEL and IVORY JAMES each sired a finalist. 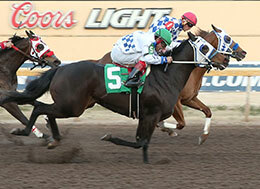 The Oklahoma Derby will be part of the undercard on Oklahoma Futurity Night, Saturday, March 24. Htr Miamor Tequilla was a head winner over last year's Remington Park Oklahoma-Bred Futurity(RG2) winner La Vencedora in the fourth trial to get the fourth fastest time of :17.289 seconds, also a 97-speed index. Ed Ross Hardy conditions the colt by second-crop sire HEART OF THE CARTEL from the Tinys First Corona mare Sheila Tequilla. Berkley Packer had the riding call aboard the HTR Stables LLC Oklahoma-bred. Graded stakes winner La Vencedora races for owner Good Memeories LLC and trainer Amanda Tongay. James Flores rode the daughter of multiple stakes sire IVORY JAMES. Bred in Oklahoma by Bobby D. Cox, La Vencedora has won four of seven career starts and banked nearly $417,000. She is out of the Mr Jess Perry mare Jess Shakem. For the complete list of qualifiers for the Oklahoma Derby, with their qualifying times, sires, dams, owners, breeders, trainers and jockeys CLICK HERE. In the $178,000 Grade 1 Oklahoma Paint and Appaloosa Futurity trials Sunday afternoon at Remington Park DOMINYUN's 2-year-old App daughter The Last Union qualified with the 7th fastest time of :15.664 seconds. The Last Union is out of Texas Union, a Appaloosa daughter of AQHA World Champion Moon Lark. The 300 yard final will be contested on March 24th. For the complete list of qualifiers for the Oklahoma Paint and Appaloosa Futurity , with their qualifying times, sires, dams, owners, breeders, trainers and jockeys CLICK HERE.